Sister Sax discos page. We DJ and provide disco entertainment too! 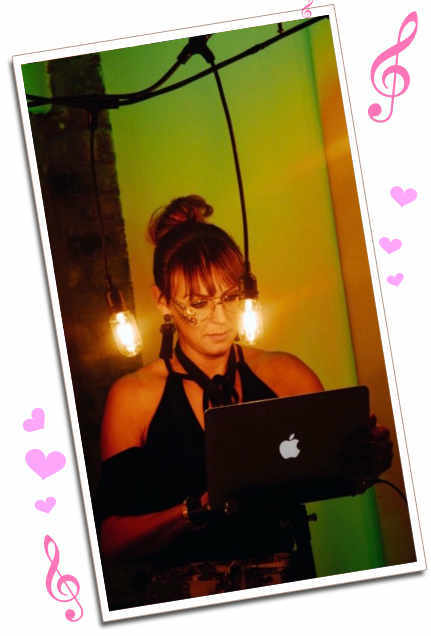 Kay has provided the disco at hundreds of functions over the years. From intimate hotel lounge rooms to elaborate and spacious wedding venues, Kay can easily adapt to suit. BRAND NEW BESPOKE RUSTIC DISCO BOOTH FOR 2018!! Adding this retro yet contemporary DJ booth to your party will enhance any venue, especially barns, and those looking for something really quirky. Rather than the old style discos with star cloths and coloured lighting, you can opt for this amazing booth with super stylish industrial lighting. The Sister Sax disco includes a powerful tower speaker and bass module. This PA set up with its spatial dispersion loudspeaker technology sound remains consistent, even at extreme sides of the system. The music will fill a room capacity of up to 500 people, achieving the greatest and most crisp sound, in even the largest of venues. Music is run through two lap tops and programmed into either ITunes playlists (using your recommended songs) and/or mixed using the Virtual DJ Mixer which is the closest to having an actual DJ mixing on CDJ's or Vinyl. 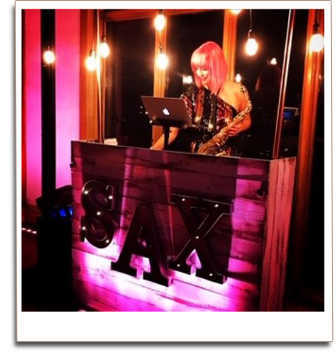 When booking Kay for the Ibiza Sax option alongside the Sister Sax Disco, she uses pre mixed music by the most experienced and talented DJ's from across Essex and London. Therefore enabling her to perform the most skilful live saxophone in seamlessly flowing sets. Disco lighting is an extremely important part of any party. 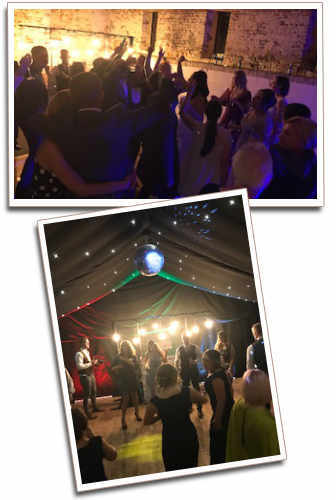 Kay uses the latest professional LED disco lights with amazing effects and projectors to enhance the mood of the evening and get the crowd moving. The lighting used will include moonflower sparkles, rotating sweepers, lasers and coloured high beamers from top known brands such as CHAUVET and AMERICAN DJ. 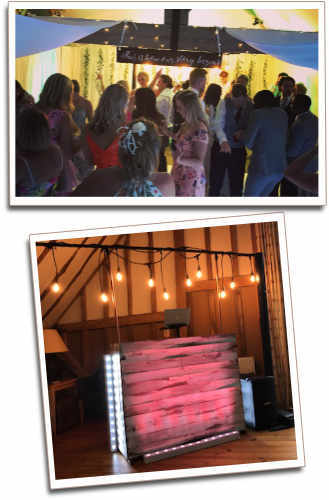 Or, choose the wooden booth with simple (yet stunning) warm white or multi coloured industrial lights. Also brand new for 2018 Kay now uses ultra bright white slimline battens for floor up-lighting. These give smooth colour mixing from rich hues to subtle pastel shades. They can be programmed with a variety of options including static colour (to match your event theme), colour fade and sound activated. The perfect finishing touch to any dance floor or around the room. The songs will be tailored to suit your tastes and Kay will go through all of this with you Prior to your party date. Not only will the music include all of your favourites, but requests can be taken by guests on the evening. This will give you and your guests memories to treasure of dancing the night away. The RUSTIC BOOTH will be used for all Discos. The WHITE SCREEN or BLUE STAR CLOTH option can be requested upon booking.